Custom Executive Decision Clocks with Dartboard Personalized in Bulk. Guaranteed lowest cost in USA and Canada. 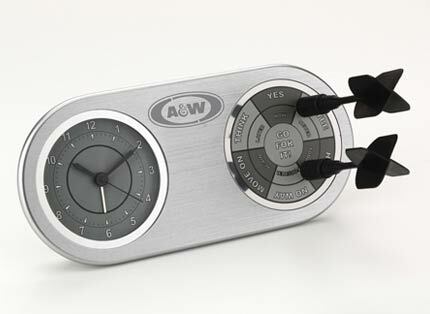 High quality, yet inexpensive Executive Decision Clock in bulk, customized with you logo. We also supply blank (not personalized) Executive Decision Clock for $19.99 each (minimum quantity: 12). Free artwork design and Free proofs! American clients pay no taxes. Bulls eye! Featuring a mini dartboard with 2 magnetic darts, this brushed silver metal desk clock will make a fun addition to any desk. The deluxe quartz movement comes complete with alarm to put the FUN back in Functional! Imprint Area: .5" H X 1" W. Unless otherwise specified on your P.O., we will imprint in the direction shown here. Packaging: Gift Boxed, 60 units per carton, 35 lbs. per carton.